Optimal control problems for a class of 1D semilinear parabolic equations with cubic nonlinearity are considered. This class is also known as the Schlögl model. Main emphasis is laid on the control of traveling wave fronts that appear as typical solutions to the state equation. The well-posedness of the optimal control problem and the regularity of its solution are proved. First-order necessary optimality conditions are established by standard adjoint calculus. The state equation is solved by the implicit Euler method in time and a finite element technique with respect to the spatial variable. Moreover, model reduction by Proper Orthogonal Decomposition is applied and compared with the numerical solution of the full problem. To solve the optimal control problems numerically, the performance of different versions of the nonlinear conjugate gradient method is studied. 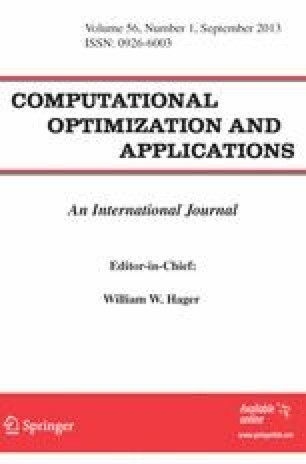 Various numerical examples demonstrate the capacities and limits of optimal control methods. This work was supported by DFG in the framework of the Collaborative Research Center Sfb 910, project B6. An erratum to this article can be found at http://dx.doi.org/10.1007/s10589-013-9570-7. The authors are very grateful to Christopher Ryll (TU Berlin, Institute of Mathematics), who updated and partially improved the numerical results of the third author after she finished her university career.